Why not ask if the Pope's a Catholic? Of course it is: that's been the basis of its economy since 1959, and nothing has changed as yet to alter. What is good is that the EU will now name it as such. Its last line of defence on this issue is crumbling. It was on a rugby tour around Dublin in 1960 and enjoying the odd half after a game when I remarked it seemed very prosperous in many ways when unemployment was on the high side. I was told that the practice of avoiding or rather evading tax was so extensive that few people paid much tax and for ordinary workers the norm was to be paid cash in hand. It was clear to me that if I went there to work I would be a lot better off. If only………. Actually, I had an aunt there married to a farmer who had a milk round in Dublin. Also, a grandfather with extensive family connections. The figure for cousins and near cousins soon runs into three figures. In that period I traveled to many parts of Ireland. I prefer to rely on their lives and work etc. rather than later commentators working from some very dodgy data. Indeed, there were the poor but not much different from those in Liverpool and other parts of the UK. Some of that Irish family were running public houses and did very well, because a lot of the poverty was caused by earnings going down the throats and Dublin was famed for its breweries. You go on banging this drum. I was expecting some substantive argument here. Ireland has a low corporate tax rate as it is perfectly entitled to do. It is not responsible for profit shifting by a handful of, mostly US, multinational corporations, nor is it obliged to be the world’s tax police in that regard. Multilateral action will be required and Ireland will participate. A list that leaves out the UK is not going to cut a lot of ice in Ireland. Taken together the UK secrecy jurisdictions make it the world’s dirty money and money laundering capital, according to the financial secrecy index, with a substantial multiple of the holdings attributed to Ireland. You won’t find tens of thousands of properties in Dublin owned by offshore companies or thousands of solicitors, realtors and others paying their children’s private school fees with money looted from Russia, Nigeria etc. Ireland simply offers a lower rate of corporate tax than some competitors and attracts some investment as result, but it is far from the main reason companies invest. NI’s politicians campaigned for a long time to be allowed to match the republic’s corporate tax rate. Now they can do so it will do them little good. Who will want to invest there when they go a few miles down the road and be inside the single market, with the best educated workforce in Europe? A list that omits the UK (higher on the FSI list than Ireland, even without its colonies) is political and the Irish are well used to politics. Also to having hypocrites invite them to confess to their sins. But is a murderer innocent of their crime because another has yet to be convicted? So, are there any countries that are *not* tax havens? As the comment above points out (if it were needed) the UK is a monstrous core of tax evasion, money laundering and channelling corrupt and illegal business practices, linked into the City’s global importance as a financial services hub and latterly the UK property market. An interesting debate would be to what extent Ireland actually had a choice in the direction it went in from 1960, say. My knowledge of the Irish economy is really limited, but at that time I understand it to have been substantially impoverished and overwhelmingly dependent on agriculture; what would the possible development paths open to it have been? On the other hand, the UK in 1960 was still a substantial (if dilapidated) manufacturing powerhouse whose variety of native industries and substantial, skilled workforce, as well as the global importance of London as a financial services sector hub gave it far greater opportunities to determine its own future. Meanwhile, in the UK we were being sold the service sector as the way forward. That meant abandoning dirty old activities like actually making things, and instead relying on far more nebulous knowledge and service products, massively dependent on the burgeoning range of financial services activities, consumption and consumer debt and held up by a property market that (apart from 1973-1974) rose continously until the UK fell out of the ERM in 1992, whereafter it rocketed again until 2008. Tax evasion, secrecy services and money-laundering were an integral part of that financial services/service sector vision and they are now so deeply interwoven in the fundamental financial flows inside and outside the UK economy that it’s hard to see how they can be disentangled without precipitating an economic collapse. What percentage of foreign investment in the UK housing market is ‘legitimate’, for instance, and what do you do about it? But come what may, the City’s current position as the money-launderer’s destination of choice is the result of a set of political decisions made over decades (New Labour’s introduction of the LLP is just one symptom of this) where the UK simply discarded the old economy, with the massive social and economic costs that involved, to launch a new economy from which the majority of the population benefit only peripherally and which has, since the 1980s, resulted in continuing, high levels of deprivation and poverty and a generalised stagnation of living standards for all except the very rich… and if you believe the current employment figures, showing how the entire population is fully-employed, I’ve got some WMDs to sell you. So, we (the UK) chose, or rather the 1% chose for us; how much choice did Ireland actually have? Ireland is not the worlds tax police ? 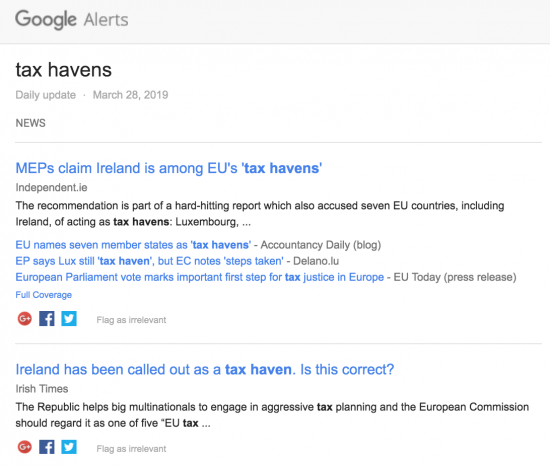 Ireland is not responsible for tax shifting ? Both statements are silly, the whole problem is that there is no world tax police each country therefore has a responsibility to police its own tax and a responsibility to stop tax shifting. Corporations should only be allowed to register in one country for tax purposes of the profits made in the country where registered. Making huge profit in a country and paying it little or no tax should be stopped it’s easy to do but the people who can make it happen just happen to be amongst those who profit from it one way or another. Governments should carry out their fair tax responsibilities to their populations and not sook up to corporations with low tax agreements and a few quid in the hipper. I can see the attraction of such simple ‘logic’, but where the Corporation is registered, is in reality, of little consequence. This is the essence of the Tax haven problem. A corporation can make all it’s profits where people live and work but register those profits somewhere else with no overhead costs; like a Caribbean Island for example occupied by a nominal head office and some sheep. Taxes need to be due, and paid in the places where the economic activity is taking place. The more we accept the ‘globalised’ range of corporations the more important this becomes. It’s already past being crucial. Low tax regime countries are basically just ‘taking the piss’.